John practiced corporate law in Chicago for ten years before working directly with Catholic organizations. He spent seven years as vice president and general counsel of FOCUS (Fellowship of Catholic University Students) in Colorado, then served as the first lay vice president of the Archdiocese of Chicago’s college seminary. John has fostered transformative gifts with a variety of donors through income and tax advantaged gift planning. Matt has 19 years of professional fundraising experience in support of religious, higher education, and healthcare organizations. 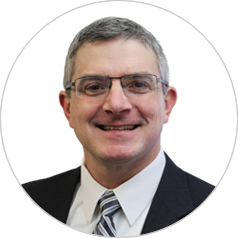 He joined The Catholic Foundation in 2017 following 14 years of service as the executive director of Memorial Healthcare Foundation in Owosso, Michigan. He has experience in capital campaigns, annual appeals, major gifts, planned gifts, corporate gifts, and fundraising events. Colleen has served the diocese in numerous roles over the past 13 years. She is responsible for database management, gift processing and donor relations, a demanding new role as we begin the Witness to Hope campaign.